Yesterday, millions of people opened the Google website to notice that the logo on top of the site now said “Topeka”, instead of “Google”. If you were not in Kansas, there was a good chance you had no idea what Topeka even meant. Sure enough, the blurb below the search buttons said: “Not in Kansas, learn about our new name“. Google CEO Eric Schmidt informs us on the Google Blog that this was done to as a return gesture to the city of Topeka, Kansas, which had recently changed its name to Google. Well, Topeka becomes Google for a month, so Google can become Topeka for a day — the April fools’ day. 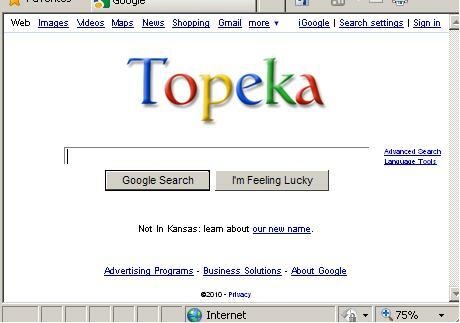 What is important, though, is why Topeka became Google, not why Google became Topeka. To know why Topeka named itself Google, you need to go back a month and a half. In February, Google announced it would install high-speed broadband networks in “a small number of trial locations across the United States”, delivering Internet speeds more than 100 times faster than what most Americans have access to today with 1 gigabit per second, fiber-to-the-home connections. In order to select their cities, Google invited responses from local governments and residents. The deadline expired last week and it seems the map is full of responses. Some cities went unconventional to attract Google’s attention. In Duluth, Minnesota the mayor jumped into ice cold water, and even said a number of kids in the city are going to be named Google. Topeka, Kansas went a step further and named itself Google for a month — something that has paid off in terms of free publicity on April Fools’ day. The mayor of Sarasota, Florida swam in a tank of Sharks। Baltimore’s mayor took things seriously and appointed a Google czar. Anyway, looks like Google has received responses from hundreds of cities and will be taking a decision by the end of 2010. On a side note, I didn’t know until today that Topeka was the capital city, no less, of Kansas. I haven’t been able to understand why US states have chosen their lesser known cities to be capitals. According to Wikipedia, 33 of 50 US states have capitals in cities that are not their most populated. California’s capital is Sacramento, not LA, New York’s is in Albany, not New York. Florida’s is in Tallahassee, not Miami. As the readers of this blog in India and elsewhere would have noted, the Google name change did not occur in their local Google sites. Google.co.in, google.com.mx, google.com.br, all appeared with their normal logos on April 1. Does Google think it can only make fools of its compatriots?